The International Camping Club is now introducing campsite reviews to a number of websites. Polls and surveys of our users and members is a growing part of what the ICC are doing to keep campers informed and to give campers a voice about camping issues. A new website dedicated to campsite reviews from around the world about campsites from around the world by our users are members is now in phase 1 release. 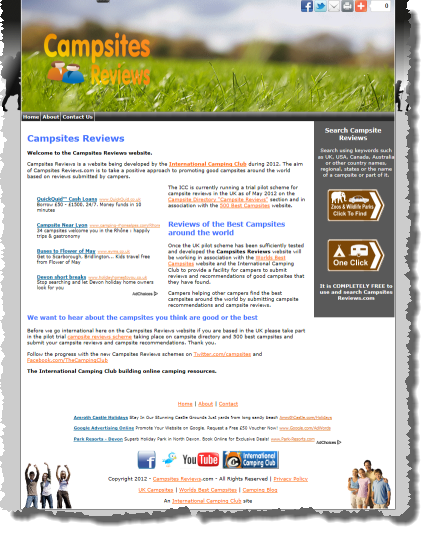 The new central review website is on ”Campsites Reviews“ from May 2012. However before introducing user and camper submitted reviews of campsites the ICC is undertaking a pilot trial in the UK. Once we are happy that the submission process is working correctly we will be introducing and international campsite review section on the new Campsites Reviews website. There is a focus on good campsites and campsites that campers are happy to recommend to other campers in our campsites reviews. Reading online rants, complaints and moans which are often bias and simply a knee-jerk reaction in many cases does not necessarily accurately reflect review of most campers experience of a particular campsite. For this reason we are interested in publishing reviews of good campsites and campsite recommendations submitted through our review sites. That is not to say that we will not be publishing constructive comments that are put in a polite, fair and balanced fashion is campsites can benefit as well as the campers that visit them from constructive criticism or comments. Also posting comments even negative comments online about a campsite can help to boost I campsites website ranking because of the link or links created in the post or article which can be counter-productive in trying to promote be good campsites around the world. In fact someone with a grievance is far more likely to rush to the internet and start posting negatively that someone is likely to rush to the Internet to highly recommend. For this reason we will also be focusing on reviews of good campsites rather than bad. Campsite reviews can also be open to misuse by competitors. How easy it can be to anonymously post negative comments about a competitor online potentially unfairly affecting their business organisation. This is yet another reason to focus on good campsite reviews and good campsite recommendations. The International Camping Club is starting the pilot trial with UK campsites before going international on the CampsitesReviews.com website. The UK trial is taking place from may 2012 on Campsite Directory and the 500 Best Campsites websites. A new campsite reviews section has been added to Campsite Directory for this purpose. We are encouraging ICC Facebook followers and members of the International Camping Club which is a free to join camping club to post reviews of good campsites around the UK to the new campsite reviews section on Campsite Directory. If you know a good campsite in the UK you would love like to submit to the campsite reviews please visit the campsite directory to submit your review online. Our central UK directory of UK campsites camping shops and days out and places to visit on Campsite Directory.co.uk now has a new look and feel for 2012. We are making a host of changes and improvements to the Campsite Directory website with a new more detailed directory planned for 2012-13 and currently under development. Campsite Directory is easy-to-use and you can search campsites, camping shops and days out or places to visit in the UK by town, county or region or even part of the site or venue name. Check it out to find over 2000 UK campsites, camping shops all over the UK and over 500 days out and places to visit like zoos, wildlife parks, theme parks and museums. We have also started tweeting links to some of the featured campsites in the campsites directory section. We are trialling a new feature on Campsite Directory where our users can submit reviews of what they think are the best campsites in the UK. Submitting a campsite review on Campsite Directory is now one of the new ways to nominate a campsite to the 500 best campsites annual survey. One of the key aims at the International Camping Club is to promote good campsites around the world. We are focusing on encouraging campers to submit positive reviews the campsites are they think are good. Strangely posting a negative review of a campsite that you dislike or had a bad experience at actually helps to promote our site as it often create a link to that campsite website and link building is one of the factors that helps websites do better in search engines. In addition if you have a bad experience at a campsite it is tempting to rush to the Internet to post a highly critical review whereas people tend not to think I need to rush the Internet to post a review of the site they loved. This can lead to not only unfair reviews or unbalanced reviews that can distort the impression of what most campers may experience in visiting the site. If in submitting a campsite review you have some negative comments about a campsite we highly recommend that you put those in proportion to your overall camping experience or view of the site. No one really enjoys reading other people’s “rants” hence our focus encouraging positive reviews of good campsites by our users. 2012 is the third year quest to find the 500 top voted campsites in the UK. please help by either nominating or voting for already nominated campsites. The International Camping Club has been very busy in 2011 launching more websites within its portfolio of camping related online resources. As part of the update process for 2011 the international bank camping club has given its own website a fresh clean look. Becoming a member of the International Camping Club is completely free! Ssigning up to become a member of the camping club is now extremely easy and takes a matter of a few clicks.. There are now a number of ways to contact the International Camping Club if you are a campsite, touring park, Holiday Park or other holiday destination or are interested in advertising on any of the International Camping Club portfolio the websites. Our dedicated camping club support site is and easy-to-use but sophisticated support facility for advertisers and listings. The ICC has also added a simple contact us at the ICC form on the contact pages on the International Camping Club and shown the various ways you can link up with us on social networking sites. The world is becoming a smaller place many people travel extensively and explore the globe. Camping is a superb way to do just that! Our aim at the International Camping Club is to link campers with the camping resources there searching for online to make it easy to plan great camping trips and holidays. Campsites Near.com is now in stage two of development. The International Camping Club is now busy promoting the Campsites Near.com website. The aim other Campsites Near.com website is very simple. …to help people searching for campsites near towns, campsites near places and campsites near locations find campsites near those locations or campsites near them. The International Camping Club is nowlinking up with campsites around the world interested in being featured on the Campsites Near.com website. Campsites Near.com is just one of the very fast growing network of camping websites that the International Camping Club publish promote. The club has a central registration process in order to make it easy for campsites, camping grounds, touring parks, holiday parks and other featured listings to maintain t the heir account, and information about their site. Through the International Camping Club’s central website on International Camping Club.com members can can maintain essential record. So if you’re a campsite interested in featuring your campsite on the Campsites Near.com website please get in touch with the International Camping Club today ready for when the site enters stage three of its launch. For International Camping Club support for campsites touring parks holiday parks and other advertisers with the ICC you can also visit the camping club support dedicated support website. The International Camping Club has introduced a new support site to make it easier for, campsites, advertisers, and camping businesses to work with the International Camping Club in promoting their camping business and camping resources online. The ICC is developing its new dedicated support website to make it easier for camping businesses and camping organisations to work with the ICCs. The support site is primarily for advertisers and camping businesses the ICC is working with to promote camping resources online. Our blog (here), support site and the International Camping Club webite between them give a host of resources and information to help camping businesses work with the ICC easily and in an organised efficient way. One of our central aims at the ICC is to help camping businesses and camping organisations promote themselve online. The ICCs invests heavily in this aim with a growing network of websites to achieve this goal. So if your a camping business wanting to speak to the ICC the new camping club support website is a great place to make contact and track your contact with us online. In addition to the revamped Camping News (UK) in 2011 and just released the International Camping Club is now working towards promoting International Camping News. A website dedicated to camping news from around the world has been launched today (phase I). We are promoting the International News site on Twitter and Facebook. … to work with these people in the camping sector to promote their camping news. So if your a campsite warden, camping retailer or other camping sector organisation we want to hear from you. Link up with “CampingNewsDesk” on Twitter and drop us a private message. We want feedback from camping businesses interested in working with the ICC on International Camping News. News about new or improved camping gear ad camping products? Special Offers and new site developments and facilities at campsites and campgrounds? If you have camping news to announce then annouce it via International Camping News. Camping News distribution about camping around the world. One of the aims of the International Camping Club is to help camping and holiday related businesses distribute their latest news and information. The ICC aim is also to link campers, caravanners and motorhome enthusiasts with the latest camping news and camping information. Camping businesses and organisations working with the International Camping Club can release news and news updates about their camping services, camping products and camping events via the Camping News website. We have launched our updated Camping News website now in 2011. The ICC and the Camping News Desk are interested in working with editors, marketing teams and publishers at any of the following categories to help them release their news online through camping news. Why publish news via Camping News? For more information visit the Camping News website. The ICC has launched the first video promoting the “coastal series” published on YouTube. The two main “camping” website in the series are Coastal Campsites and Coastal Holiday Parks but every loves a change of holiday once in a while so the other ones in the coastal series we hope will prove useful to campers using our fast growing portfolio of websites. “Holiday Parks” can accept tents but don’t have to to feature on the Coastal Holiday Parks website. If you run a holiday park on the coast you should be applying to get your park listed ready for phase II of the launch shortly. Coastal holidays are popular holiday destinations in the UK. Holiday Parks all round the UK coast are great places for family holidays and relaxing or having fun by the sea. Seadide holiday parks - great for all the family for fab family holidays in the UK. The pace of expansion of the International Camping Club network of targeted websites is relentless. In the UK there are easily over a million people that go camping every year many of those looking for great campsites for the family and great campsites for their kids! Our aim at the International Camping Club is to promote campsites and camping resources online in a targeted fashion. Our extensive network of campsites covers a range or regional or targeted websites. … being just a few examples of our regional camping websites. Different sectors of the camping community are looking for different tyoes of campsites so a growing number of our camping community websites are targeted and different sections of the camping community. Our Adult Only Campsites site is aimed at adult only campsites but this is only part of the camping community being adults looking for quiet tranquil child free camping. Our new “Camping With The Kids” website is aimed at families looking for campsites and camping resources for great family camping holidays with the kids. 2011 sees the initial launch of the “Camping With the Kids” website and over the next few months ready for 2011-12 we will be linking up with child friendly campsites to feature on the new site.